Product Description: less text Define your love for mummy dearest this Mother's Day with this useful and meaningful gift. 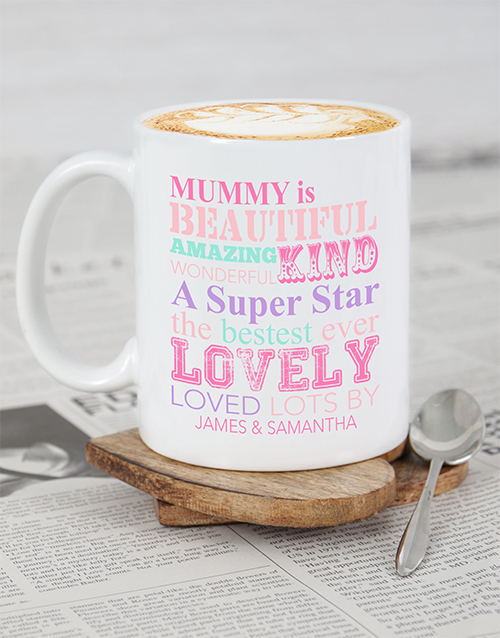 A mug is branded with a unique 'Mummy' design which is personalised with a name and message. Purchase the mug as is or combine with Toni's Tea (8 pc), Indonesia Coffee, Lindor Milk Lips, or Nestle Hot Chocolate sachets (4). Send now! Get this Personalised Mummy Mug delivered with NetFlorist.